From native Americans to Spanish explorers to the missions and Mexican ranchos to Gold Rush pioneers to Hollywood movie makers and all the way to the movers and shakers of the present, the Santa Clarita Valley has always had its share of colorful and legendary characters. Co-authors E.J. Stephens, Kim Stephens and Dr. Alan Pollack will give a talk on the prominent contemporary people and historical figures that comprise their new book “Legendary Locals of the Santa Clarita Valley” before the Santa Clarita Valley Historical Society on Sunday, Sept. 30, at 2 p.m. The talk will be held at the Saugus Train Station at Heritage Junction in William S. Hart Park. The talk will be followed by a book signing session with the authors. “Legendary Locals of the Santa Clarita Valley” is the newest addition to Arcadia Publishing’s “Legendary Locals” book series. Each book in the series delves into the history of some of the unique individuals and groups, past and present, who have made a memorable impact on their community throughout its history. Vintage images coupled with facts and anecdotes culled by local authors reveal the fascinating history of legendary people in downtowns and small towns across the nation. Cradled among chaparral-covered canyons an hour north of downtown Los Angeles is a fascinating place called the Santa Clarita Valley. The history of the valley has significantly shaped the cultural development of Southern California for centuries. But while events are often credited with creating its history, the true portrait of the valley is painted using the palette of personalities who left their indelible mark on the landscape. It is these stories of cowboys, native Americans, outlaws, farmers, shepherds, soldiers, miners, range warriors, ranchers, saloon keepers, stagecoach drivers, railroaders, town drunks, teetotalers, engineers, land speculators, explorers, missionaries, actors, and common folk that make the history of the Santa Clarita Valley so compelling. 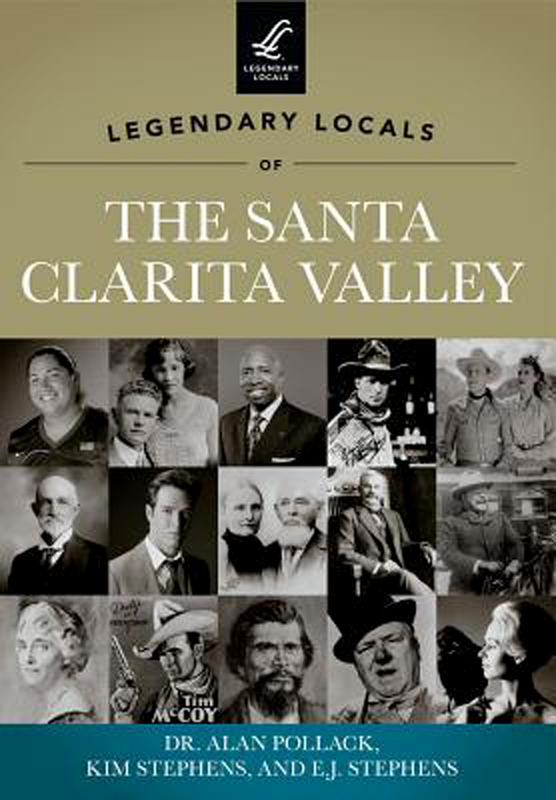 “Legendary Locals of the Santa Clarita Valley” is a pictorial journey through time, telling tales of the colorful cast of characters found sprinkled throughout the region’s past, and the “legendary locals” who still make history today. About the authors: Alan Pollack, M.D., is president of the Santa Clarita Valley Historical Society and a frequent writer and lecturer on local history. Kim and E.J. Stephens are local historians who lead Hollywood history tours throughout Southern California. All live in the Santa Clarita Valley. The general public is welcome to attend the discussion. Admission is free. For more information about SCV Historical Society events call 661-254-1275 or visit www.scvhs.org.